Для аудиоконденсаторов jb запускает три новых металлизированных полипропиленовых конденсатора новой серии и четыре новых e-caps серии, которые принесут вашей аудиосистеме отличную производительность. Если вы ищете полный спектр аудиоконденсаторов, которые поставляются с небольшим, высоким качеством, хорошей производительностью и конкурентоспособной ценой, не пропустите нас! Как вы знаете, серии аудио JB очень сильные и популярные серии. Каждый год мы получаем много заказов, начиная от известных производителей звукового оборудования. Благодаря тому, что мы получили многочисленные поддержки и ожидания клиентов, мы выпустили новую аудио-серию в ответ на рыночный спрос. JPX - это высококачественные аудиоконденсаторы, отличная звуковая производительность. это лучшие аудиоконденсаторы на рынке Китая! Если вы ищете высококачественные аудиоконденсаторы, пожалуйста, не пропустите эту хорошую возможность! 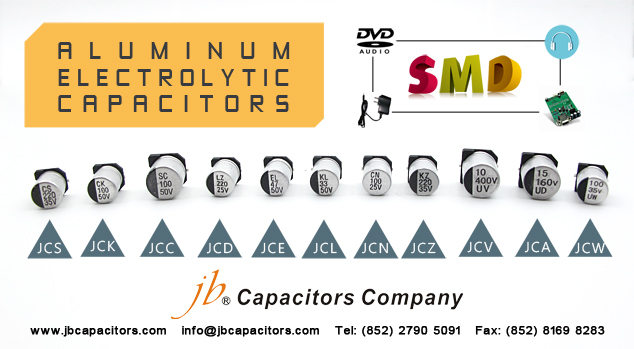 Como você sabe, nós fornecemos muitos novos tipos de capacitores de áudio. Mas os mais populares são nossas séries JFX e JSX. Recebemos muitos re-pedidos todos os anos de fabricantes de equipamentos de áudio famosos. 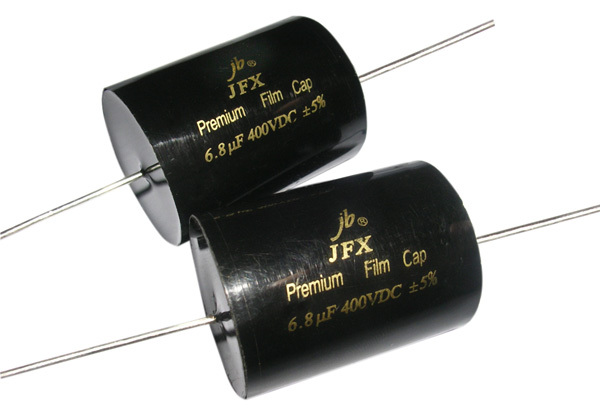 O capacitor de áudio JFX / JSX é uma excelente substituição da ERSE, Mundorf - MCAP MKP, Jantzen Audio, Mallory, BENNIC, SCR / SOLEN, Auricap, INTERTECHNIK, Ampohm sériede áudio etc. Pode oferecer um desempenho de som perfeito com certeza! Bem-vindo a enviar-me o seu pedido exato ou pedir AMOSTRAS GRATUITAS! 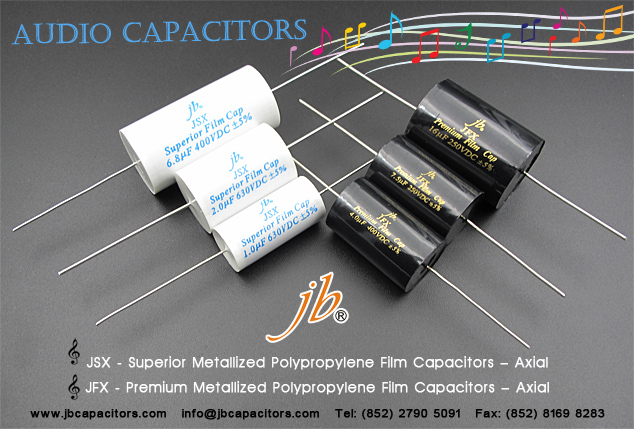 capacitors, our prices are much more better, MOQ is is flexible. are much more lower, it is white color with golden letter, very nice. And it is silver-plated copper leads. 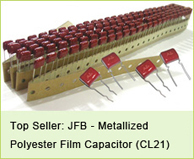 competitive prices, flexible quantity and short delivery time. 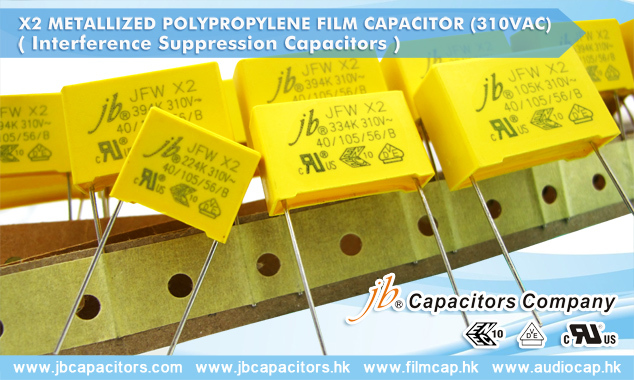 Most important, we produce very wide capacitance and meet many customers' needs. 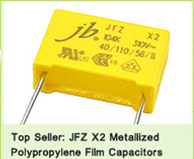 From 1000pF to 400uF, can you send your RFQs for quote? Very appreciated your inquiry. 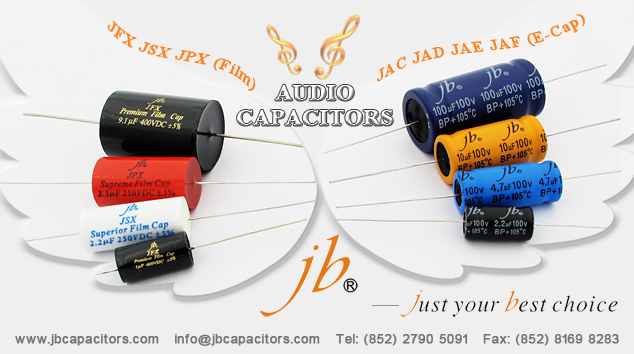 Audiophile grade, JFX series Premium Metallized Polypropylene Film Capacitors (also called audio film capacitors) have been specially manufactured and developed by ISO jb Capacitors Company, to be used for high end audio applications (loudspeakers, amplifiers, coupling, power supply, etc). 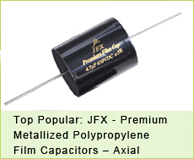 This high quality Premium Audio film capacitor provides perfect sound quality,stability. only the best will do. Replace ERSE, Mundorf - MCAP MKP, Jantzen Audio, Mallory, BENNIC, SCR / SOLEN, Auricap, INTERTECHNIK, Ampohm audio series. Welcome to click below for more details. ♫ Common Value Table and Datasheet PDF download. ♫ Features, Cross Guide, and Applications. 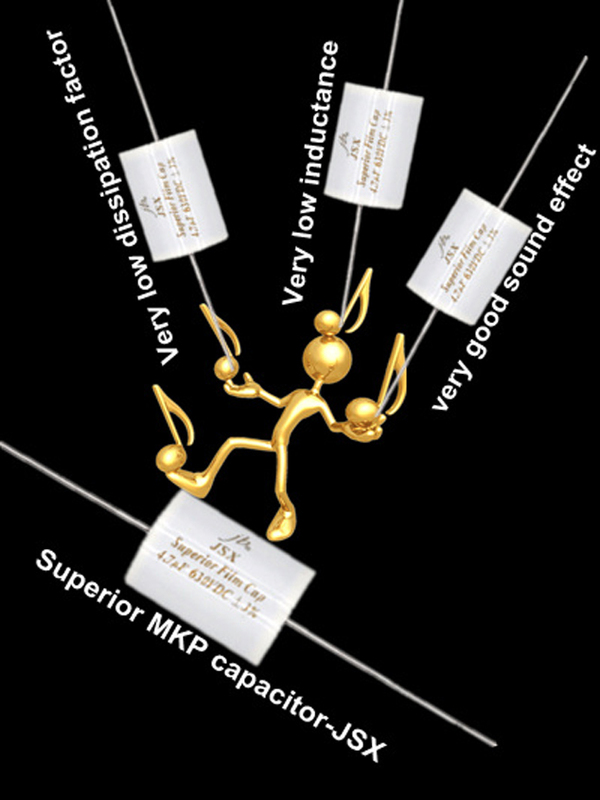 ♫ Support you can get : Price, MOQ, Free Samples, JFX Leaflets. 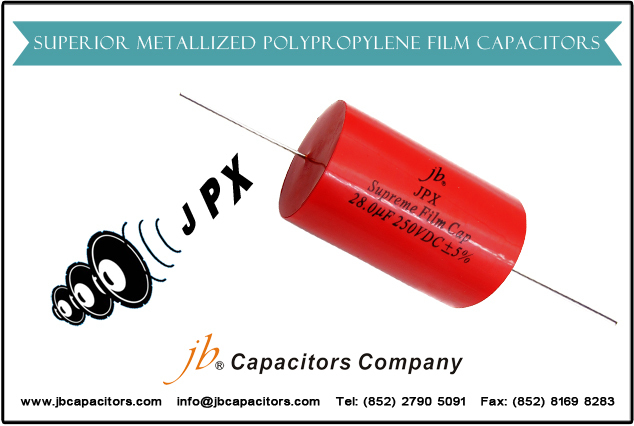 The inherently low dissipation and dielectric absorption factors of polypropylene, allied with an excellent mechanical stability, result in an extremely detailed and pure sound. 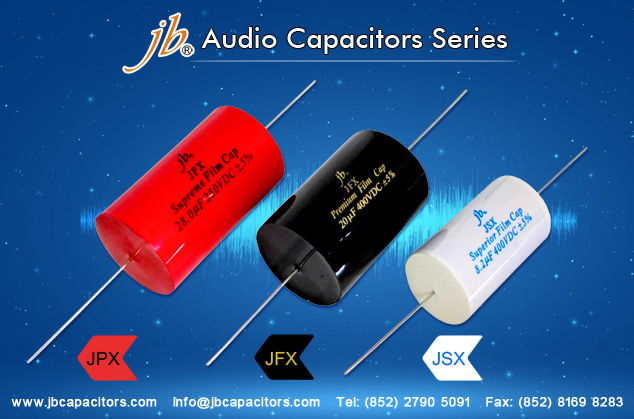 Ideal for high power crossovers, Loudspeaker crossover networks, high power stereos, Power Supply. 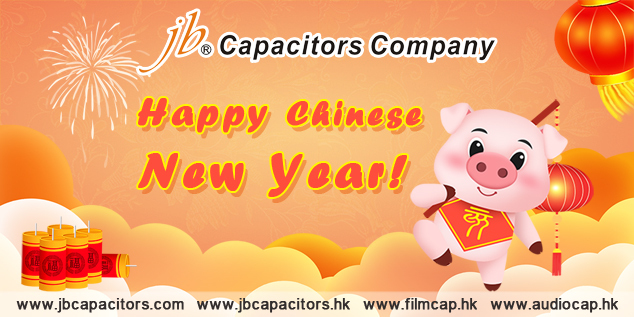 Common values: 1µF, 2.2uF, 3.3uF, 4.7uF, 5.6uF, 6.8uF, 8.2uF....exact values please check our common value table. Cross guide: ERSE, Mundorf - MCAP MKP, Jantzen Audio, Mallory, BENNIC, SCR / SOLEN, Auricap, INTERTECHNIK, Ampohm audio series.